No, it isn't a horror movie -- it's the conditions workers braved to build three new bridges in Northern Ontario in record time. 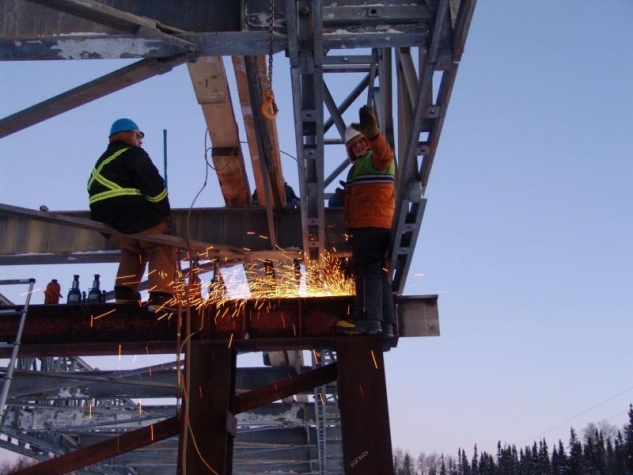 "Everyone involved with this project went the extra mile," says Ray Krisciunas, Head of Structural Transportation for the Ministry of Transportation in Thunder Bay. "From suppliers, construction crews, to local restaurants, this was a true example of people pulling together to serve a network of communities -- and finding new ways to do it." From the end of January to mid-March, transport trucks move goods on roads made of ice and snow from Pickle Lake to Ontario's northernmost communities. Pickle Lake Township, a 30 hour drive from Toronto, is the ending point of all paved roads. It's aptly called the 'Last Frontier'. Any winter deliveries going further north travel on a network of frozen lakes and rivers that require arctic-cold temperatures for safe ice thickness. 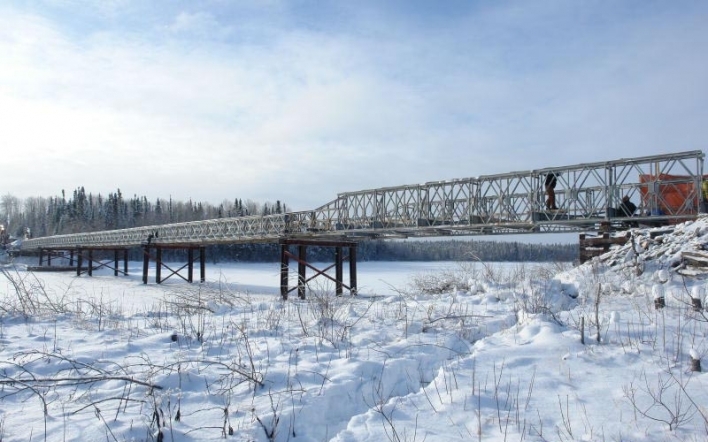 Winter access roads, such as the Northern Ontario Resource Transportation (NORT) Road starting in Pickle Lake, twist through dense forests and connect over turbulent rivers and bodies of water by modular 'Bailey' bridges. 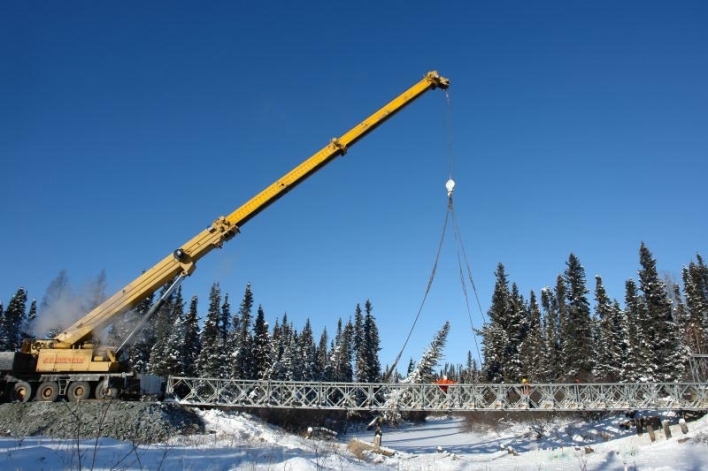 When MTO found this past December that three NORT Road modular bridges were no longer safe for heavy trucks, the ministry and its contractors worked quickly to find a solution. Without one, communities and businesses would not receive supplies until the next winter or would pay more in the middle of an already stark economic downturn. "These bridges are crucial to the communities and industries," says Krisciunas. They normally take a year to plan, design and build, but we didn't have that kind of time." Thousands of First Nations people rely on this transportation network for everything from heating-fuel and food to new modular homes. Mining and logging operations, the area's largest employers, use these roads to ship goods and receive supplies. 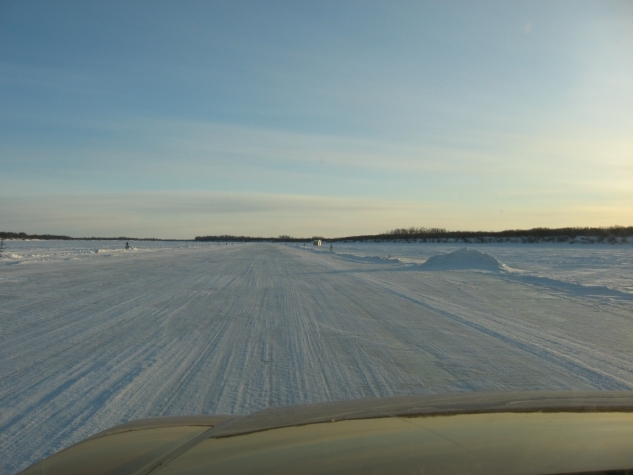 Without winter access roads, flight is the only way to make deliveries to communities north of Pickle Lake. Deliveries by airplane or helicopter substantially increase the cost of goods for consumers and industry and are not feasible for longer and bulkier materials, such as fuel storage tanks. It seemed impossible to replace three bridges without closing the NORT Road for an extended period. But the new bridges didn't take a year or even months; it took less than six weeks: two for design, two for procurement and less than two to build. Getting the job done in short order meant careful coordination and innovative bridge replacement techniques. 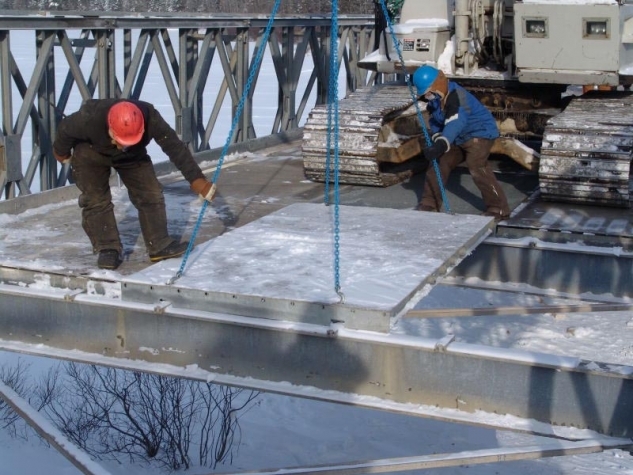 The Structural Design Team ordered bridge material from Algonquin Bridge in Barrie, and used existing MTO stock for parts not available under such tight deadlines. Foundations were prefabricated in MTO's Thunder Bay yard over the Christmas holidays, and all building materials were delivered to the site ahead of construction crews. When T & K Sharp and LH North General Contractors arrived, they worked well into the night taking occasional breaks in 'warming shacks'. They brought cranes, not usually used in modular bridge replacement, to expedite the process. Most cranes are not built to operate at minus 40 degrees Celsius. "They kept breaking down," Krisciunas says. "With no crane repair shop close by, construction crews had to diagnose and fix mechanical problems themselves." The most remarkable part: construction was done at temperatures that plummeted with wind chills into the minus 50s. "It was really cold. But as long as you were moving it was bearable," Krisciunas says. "When the machinery started breaking down we had guys working on ice-cold metal with their bare hands." "To minimize delay, we decided to keep the machines warm, periodically running them at night. That meant sending guys out into the pitch black to start them up. It didn't take long, and crews started hearing wolves lurking in the woods. They couldn't venture out alone -- they used a buddy system -- with one person always on watch." To speed things up, MTO staff devised a new bridge replacement method, calling it 'push-pull'. As the old Bailey bridge was pulled off, the new bridge was joined to it with a custom-made crossover link which helped push the structure onto supports simultaneously. According to Ministry of Transportation staff, it had never been done before. Saving time and cost, the engineers are now looking forward to further exploring the techniques' use in future projects. 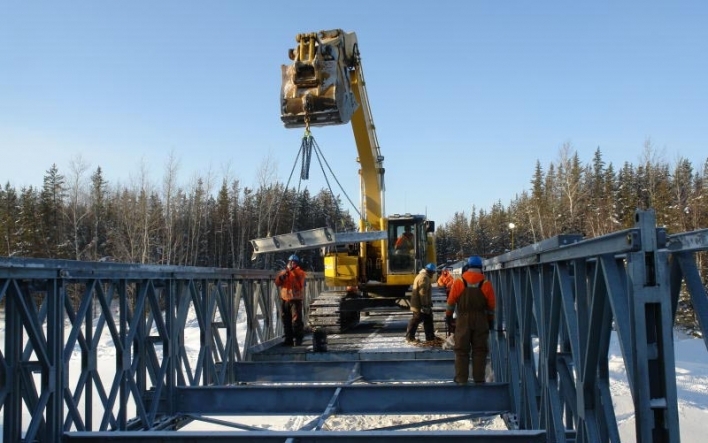 The Pickle Lake NORT Road modular bridge replacement project is testament to the possibilities when government and private partnerships in Ontario work together. This document was published on March 31, 2009 and is provided for archival and research purposes. Ontario’s northern most communities are connected by a vast network of winter ice roads.